For developers, design agencies and estate agencies alike, we manufacture from a variety of materials including aluminium, GRP, Perspex and Foamex. Our state of the art digital print technology in high resolution produces vibrant colours to bring your brand to life. We can supply with or without legs and fixings as well as offer a full installation service. we transform your hoardings into valuable marketing and branding opportunities. We print onto quality aluminum composite (ACM) that is affixed directly to existing timber site hoardings. Using the latest printing technology, quality materials, and decades of experience, we can produce cost-effective, high quality imagery to expand your marketing capabilities on site. Marketing Suites have progressively become more innovative and are essential to your marketing campaign. We can produce and install design-specific internal displays, custom-printed wallpaper, external signage, and window graphics to suit your requirements. We appoint a specific sales manager to each project to ensure continuity through the process from concept to installation. We have the solutions to make your designs a reality. Wayfinding signage is dependent upon the thoroughness of planning. They should deliver the right amount of information at the right time and in the right place. Well-planned signage is clear and concise and leaves the visitor with a positive experience having been able to find their way easily in a new environment. 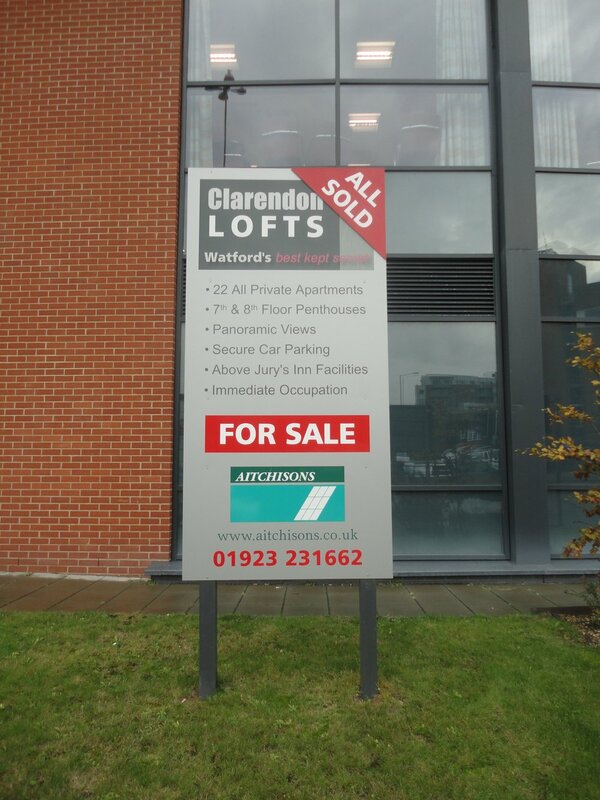 At Newhomesigns, we offer a variety of wayfinding signs from AA sytle directional arrows to free standing modular systems and full service from design and manufacture to installation. Polyester flags, single or double sided, are printed to your design and your corporate identity. Aluminium flag poles are available in various heights and colours with the option of rotating arms, finials and ground sockets. Feather flags are the perfect solution to portable displays, being durable and cost effective with a variety of sizes.